You will receive 4-6 eye root stock from us. The "eyes" or "buds" are where the new growth will sprout from next season. 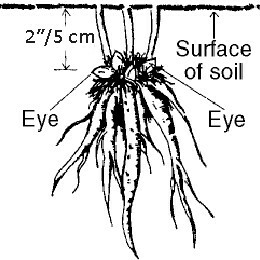 The "eyes" should be no more than two inches below the surface of the soil. If peonies are planted too deep, they may not flower for several years (or, in some cases, may hardly flower at all). If you want your peonies to thrive, dig a hole that is wider and deeper than you need for the plant. At the bottom of the hole put a layer of compost, bone meal, or well-aged manure (or a combination of these). Mix the soil you dug out with some of the compost, bone meal or well-aged manure. Add the soil back into the hole and make a small mound. Put the peony root on top of the mound. Spread the roots out evenly around the mound. Place the peony in the hole, making sure the eyes are not more than 2 inches below the ground surface. Fill the hole with the remaining soil mixture. Pat down the soil, water well and wait for nature's miracle to happen.